The name 'sensitive fern' comes from the habit of the fronds turning yellow and dying down after the first real frost of the season. It is however very tough and hardy. It is a native of North America and naturalised in Britain. It spreads with shallow rhizomes, especially in wet to moist soils. It is easy to remove if it spreads beyond its boundaries. 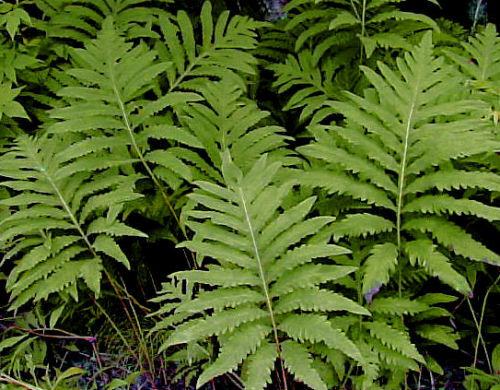 The fertile fronds appear in late summer and are upright structures with gren bead like growths that contain the spores.The spores are released in late winter/early spring. The spring growth of these ferns is impressive with lovely reddish new growth and red stipes.